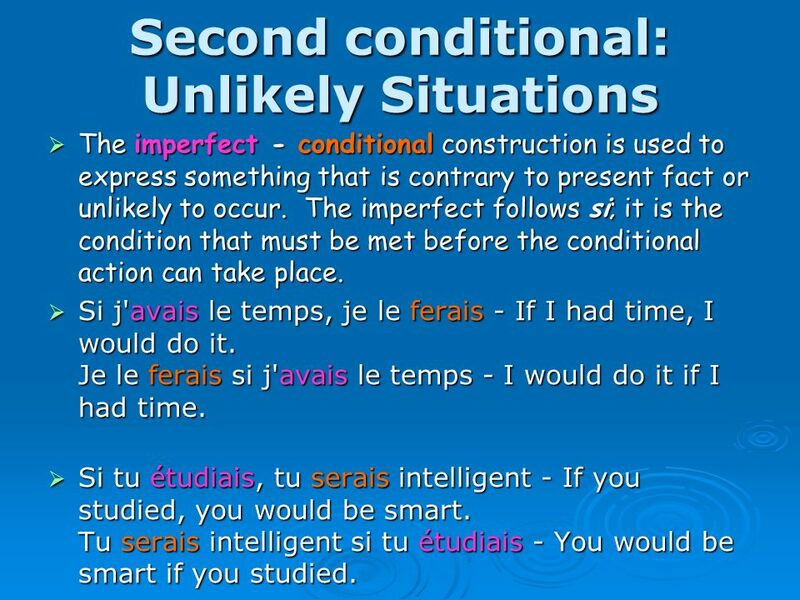 3 Second conditional: Unlikely Situations The imperfect - conditional construction is used to express something that is contrary to present fact or unlikely to occur. The imperfect follows si; it is the condition that must be met before the conditional action can take place. The imperfect - conditional construction is used to express something that is contrary to present fact or unlikely to occur. The imperfect follows si; it is the condition that must be met before the conditional action can take place. Si j'avais le temps, je le ferais - If I had time, I would do it. Je le ferais si j'avais le temps - I would do it if I had time. Si j'avais le temps, je le ferais - If I had time, I would do it. Je le ferais si j'avais le temps - I would do it if I had time. Si tu étudiais, tu serais intelligent - If you studied, you would be smart. Tu serais intelligent si tu étudiais - You would be smart if you studied. Si tu étudiais, tu serais intelligent - If you studied, you would be smart. Tu serais intelligent si tu étudiais - You would be smart if you studied. 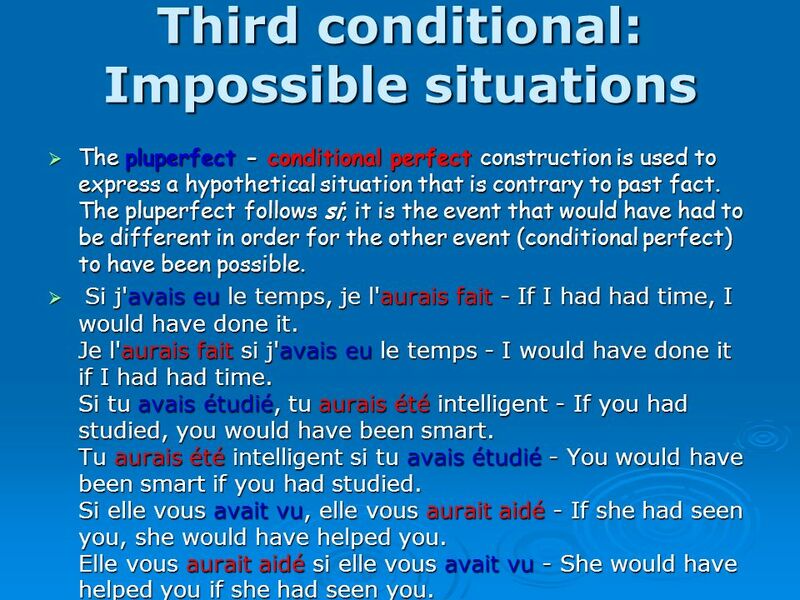 4 Third conditional: Impossible situations The pluperfect - conditional perfect construction is used to express a hypothetical situation that is contrary to past fact. The pluperfect follows si; it is the event that would have had to be different in order for the other event (conditional perfect) to have been possible. 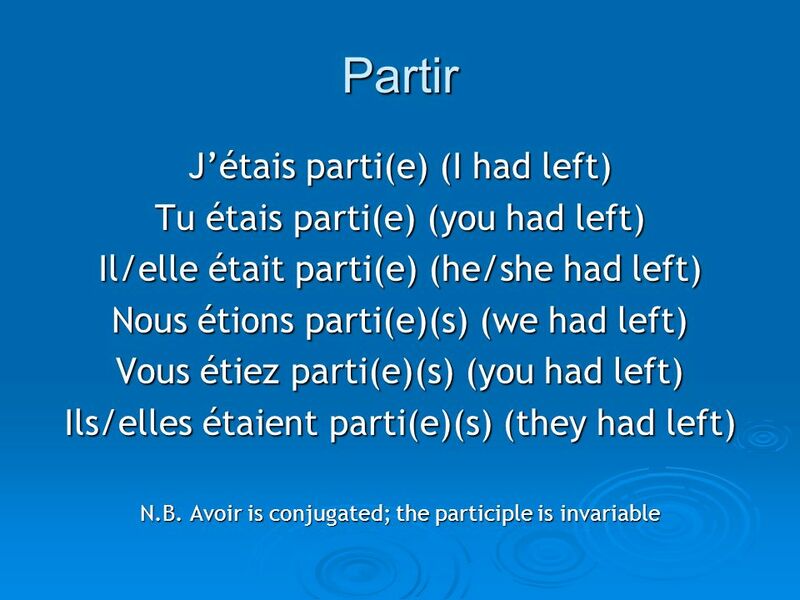 The pluperfect - conditional perfect construction is used to express a hypothetical situation that is contrary to past fact. The pluperfect follows si; it is the event that would have had to be different in order for the other event (conditional perfect) to have been possible. Si j'avais eu le temps, je l'aurais fait - If I had had time, I would have done it. Je l'aurais fait si j'avais eu le temps - I would have done it if I had had time. 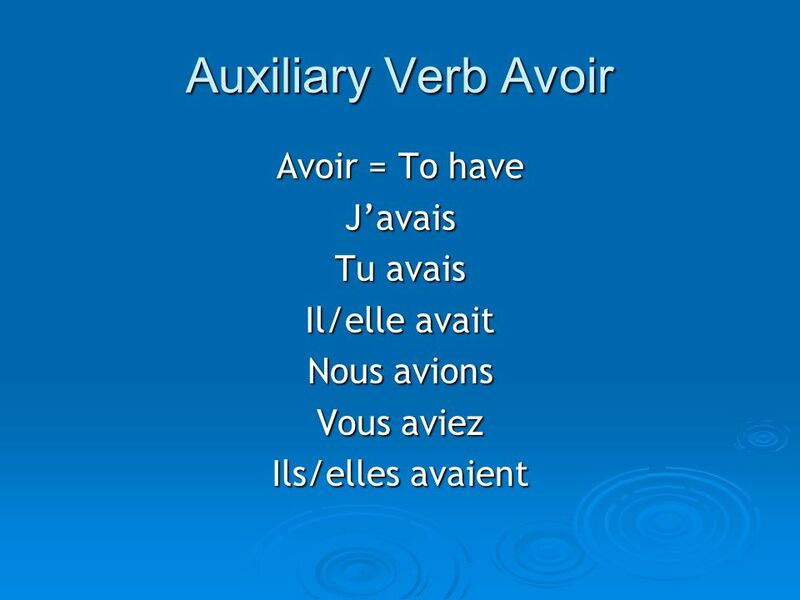 Si tu avais étudié, tu aurais été intelligent - If you had studied, you would have been smart. 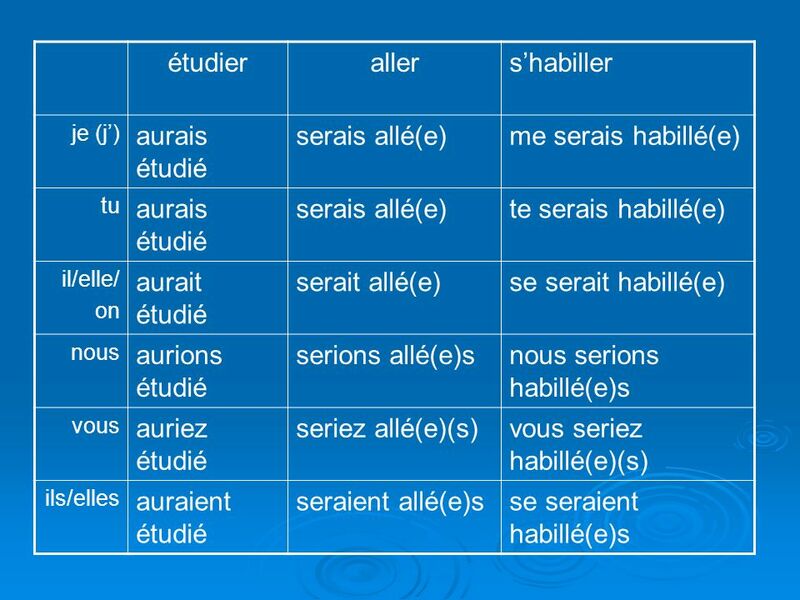 Tu aurais été intelligent si tu avais étudié - You would have been smart if you had studied. Si elle vous avait vu, elle vous aurait aidé - If she had seen you, she would have helped you. Elle vous aurait aidé si elle vous avait vu - She would have helped you if she had seen you. Si j'avais eu le temps, je l'aurais fait - If I had had time, I would have done it. Je l'aurais fait si j'avais eu le temps - I would have done it if I had had time. 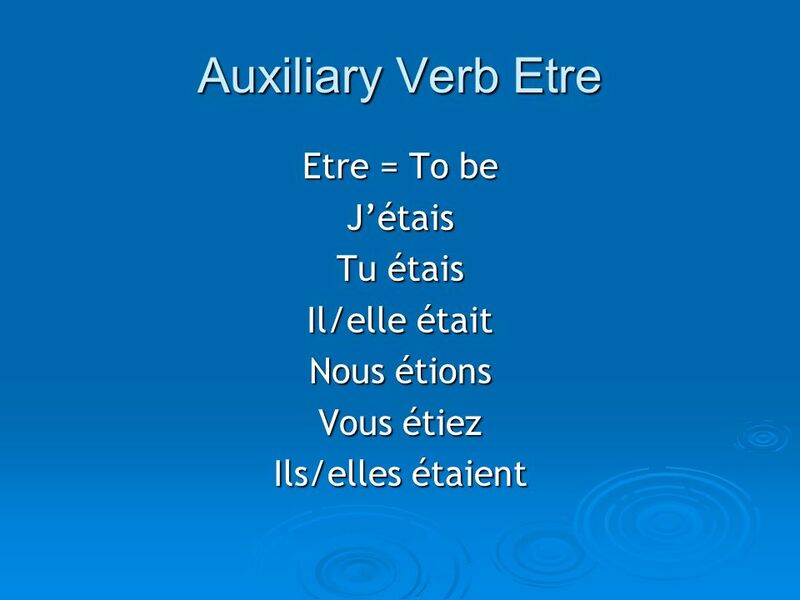 Si tu avais étudié, tu aurais été intelligent - If you had studied, you would have been smart. Tu aurais été intelligent si tu avais étudié - You would have been smart if you had studied. Si elle vous avait vu, elle vous aurait aidé - If she had seen you, she would have helped you. 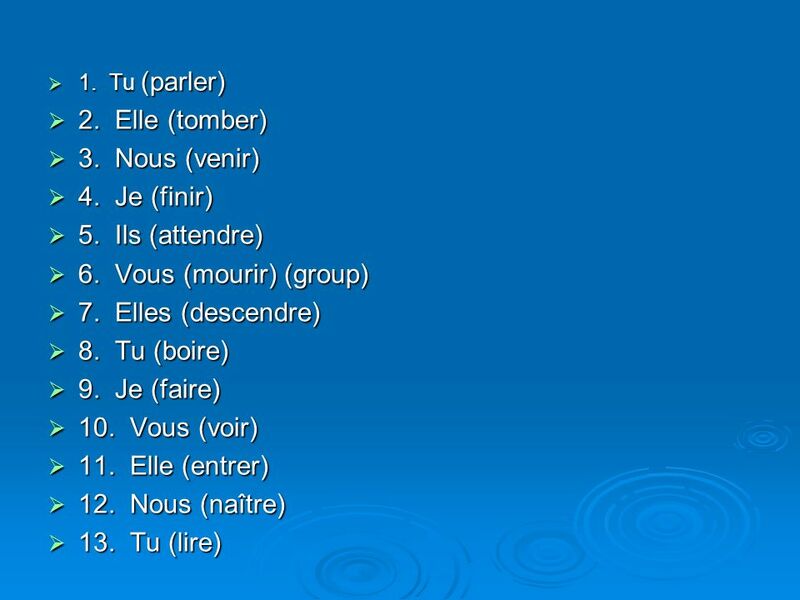 Elle vous aurait aidé si elle vous avait vu - She would have helped you if she had seen you. 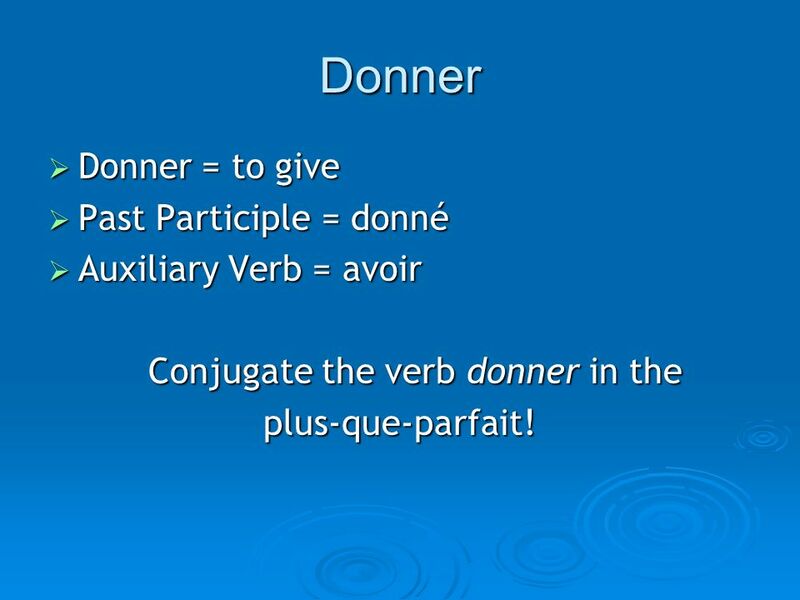 10 Donner Donner = to give Donner = to give Past Participle = donné Past Participle = donné Auxiliary Verb = avoir Auxiliary Verb = avoir Conjugate the verb donner in the plus-que-parfait! 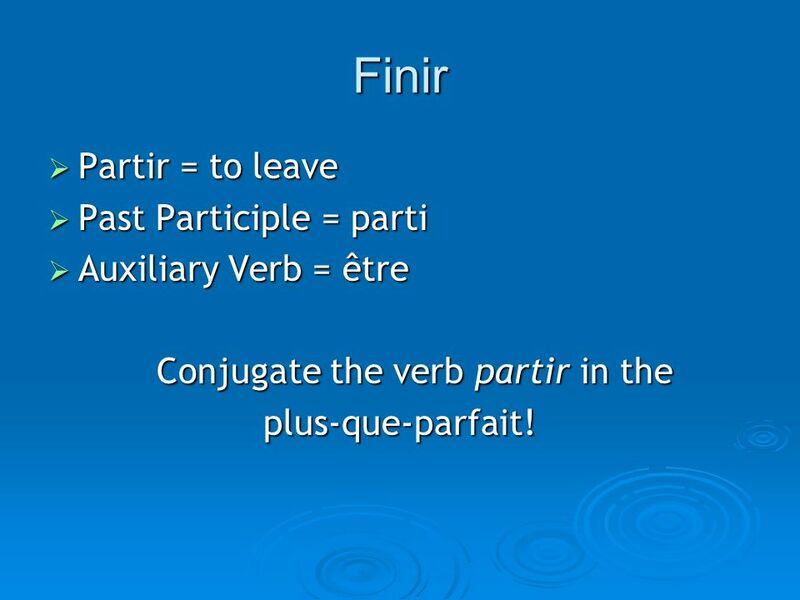 13 Finir Partir = to leave Partir = to leave Past Participle = parti Past Participle = parti Auxiliary Verb = être Auxiliary Verb = être Conjugate the verb partir in the plus-que-parfait! 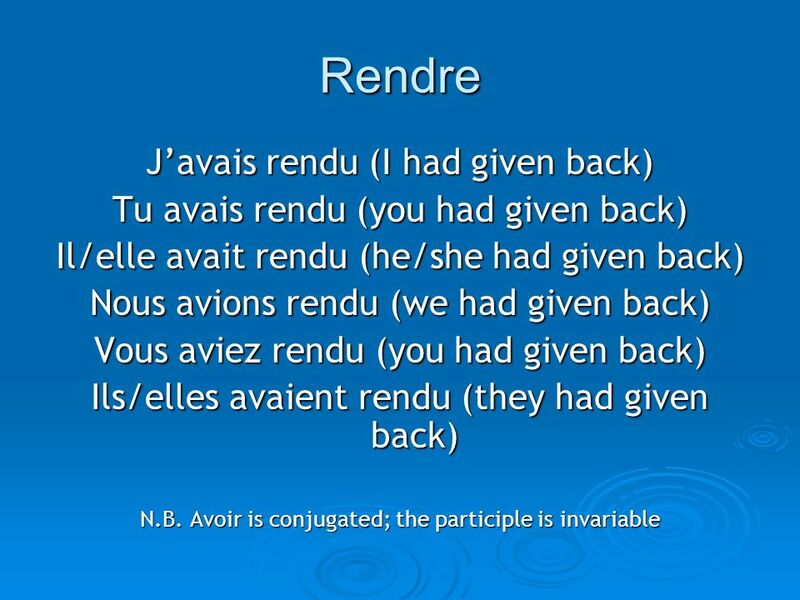 16 Rendre Rendre = to give back Rendre = to give back Past Participle = rendu Past Participle = rendu Auxiliary Verb = avoir Auxiliary Verb = avoir Conjugate the verb rendre in the plus-que-parfait! 18 Laccord du Participe Passé Noubliez pas les régles de laccord! Noubliez pas les régles de laccord! 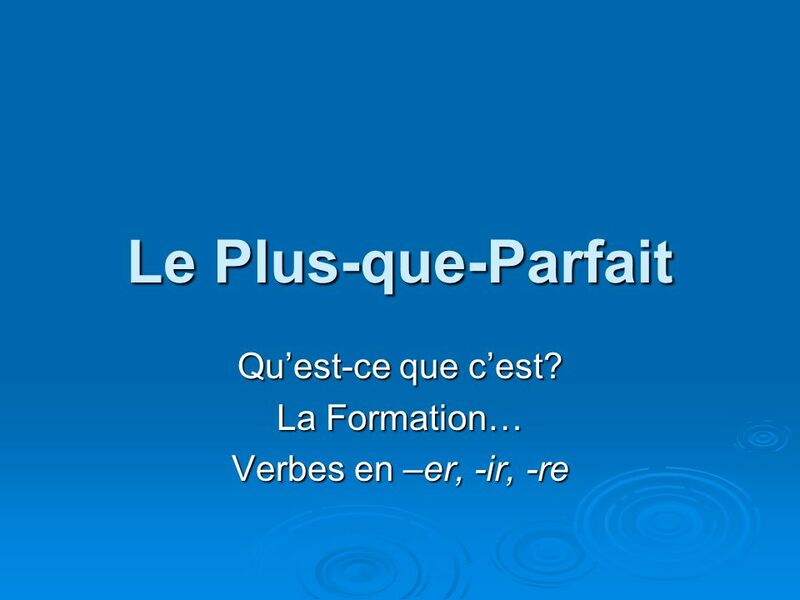 20 Les Emplois Use to indicate what would have happened if circumstances had been different (si + plus-que- parfait). 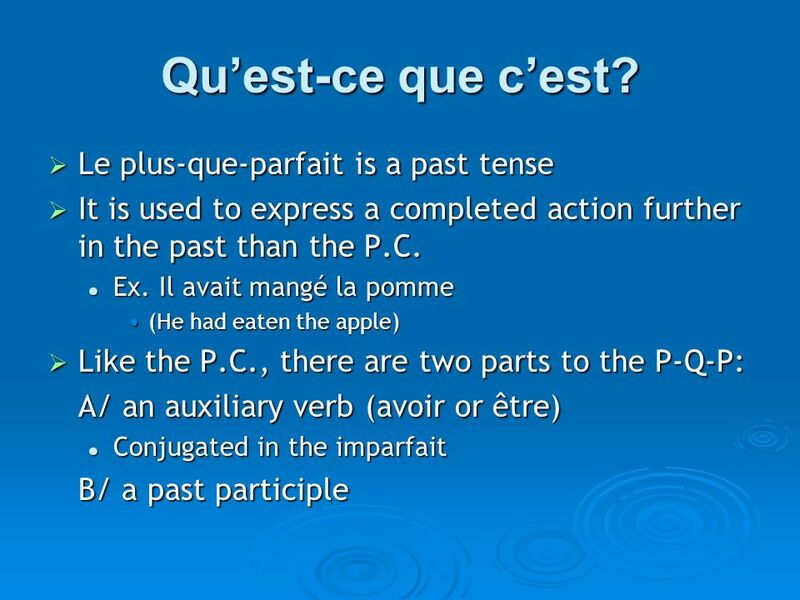 NOTE this is a hypothetical situation & either clause can begin the sentence: Use to indicate what would have happened if circumstances had been different (si + plus-que- parfait). 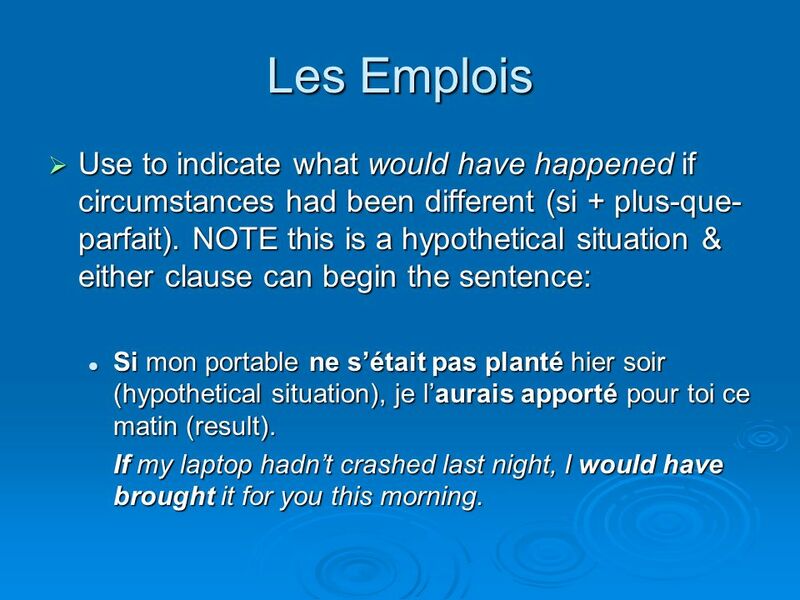 NOTE this is a hypothetical situation & either clause can begin the sentence: Si mon portable ne sétait pas planté hier soir (hypothetical situation), je laurais apporté pour toi ce matin (result). Si mon portable ne sétait pas planté hier soir (hypothetical situation), je laurais apporté pour toi ce matin (result). If my laptop hadnt crashed last night, I would have brought it for you this morning. 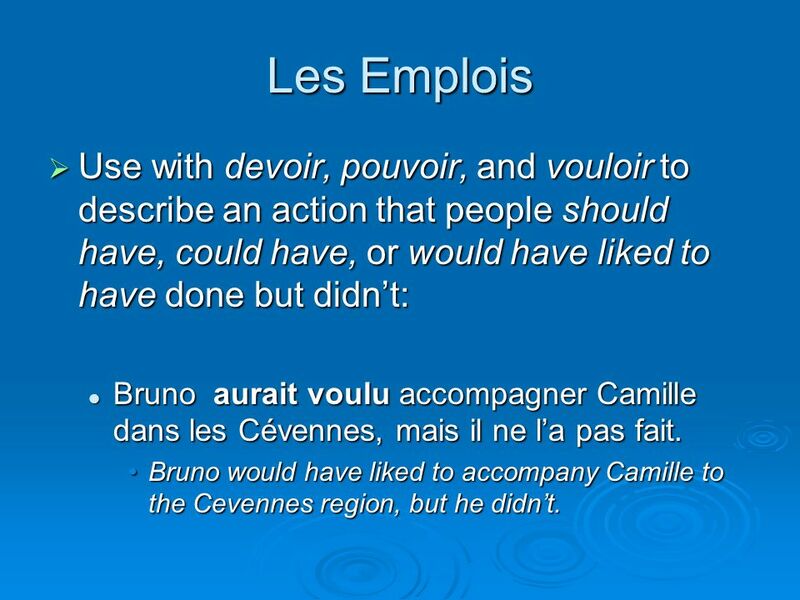 21 Les Emplois Use with devoir, pouvoir, and vouloir to describe an action that people should have, could have, or would have liked to have done but didnt: Use with devoir, pouvoir, and vouloir to describe an action that people should have, could have, or would have liked to have done but didnt: Bruno aurait voulu accompagner Camille dans les Cévennes, mais il ne la pas fait. Bruno aurait voulu accompagner Camille dans les Cévennes, mais il ne la pas fait. Bruno would have liked to accompany Camille to the Cevennes region, but he didnt.Bruno would have liked to accompany Camille to the Cevennes region, but he didnt. 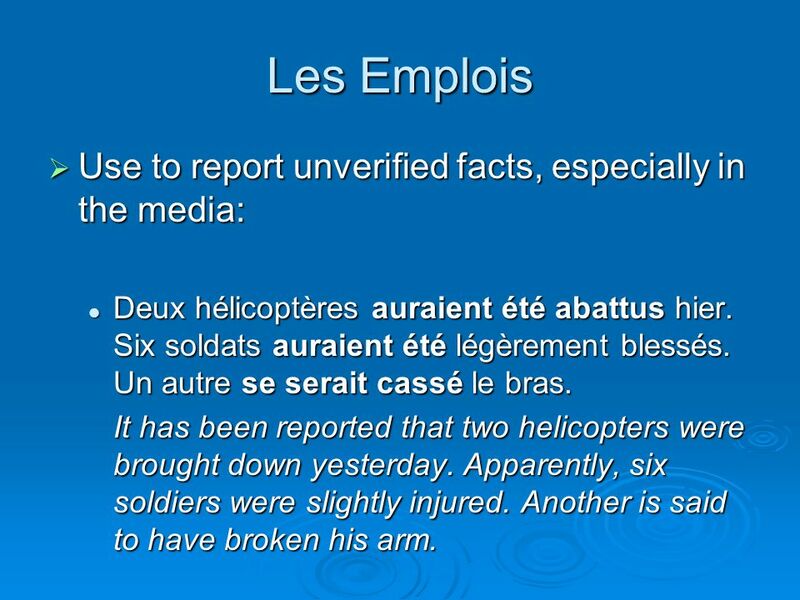 22 Les Emplois Use to report unverified facts, especially in the media: Use to report unverified facts, especially in the media: Deux hélicoptères auraient été abattus hier. Six soldats auraient été légèrement blessés. Un autre se serait cassé le bras. Deux hélicoptères auraient été abattus hier. Six soldats auraient été légèrement blessés. Un autre se serait cassé le bras. It has been reported that two helicopters were brought down yesterday. Apparently, six soldiers were slightly injured. Another is said to have broken his arm. 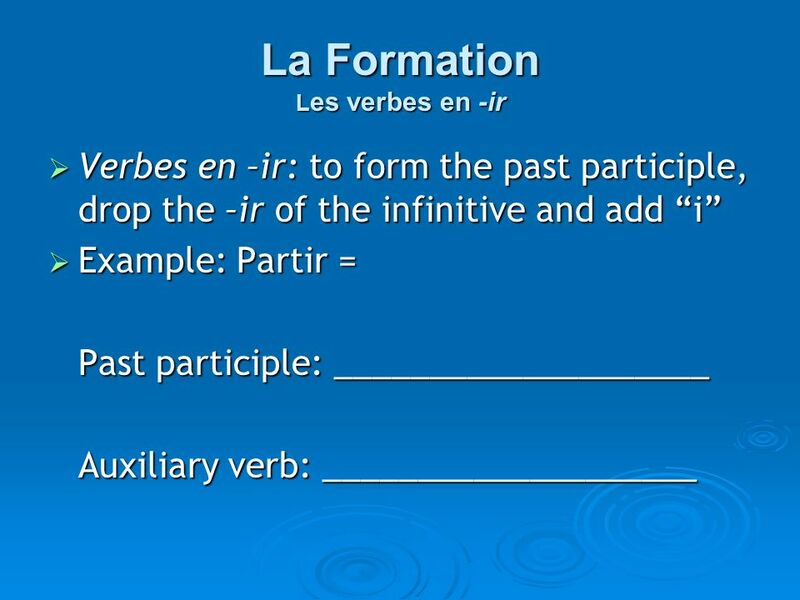 23 Formation Combine the helping verb in the conditional tense with the past participle of the main verb. 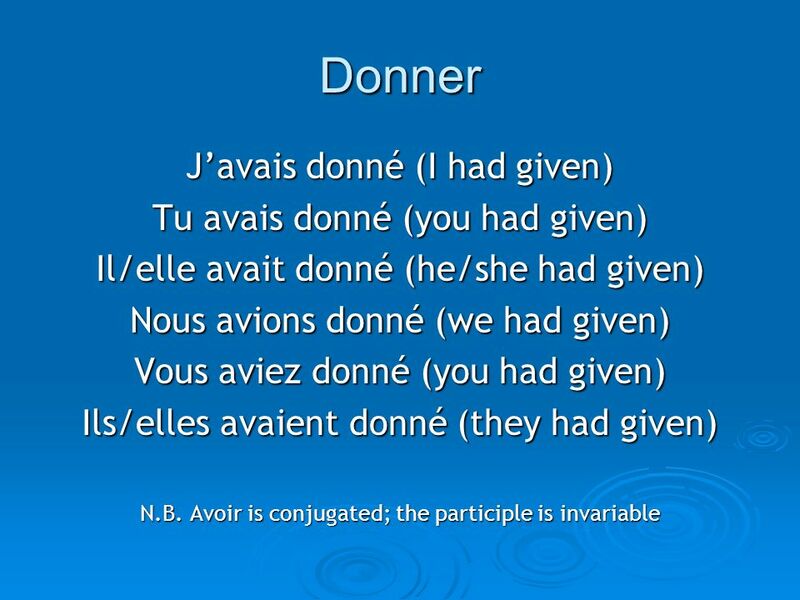 Combine the helping verb in the conditional tense with the past participle of the main verb. 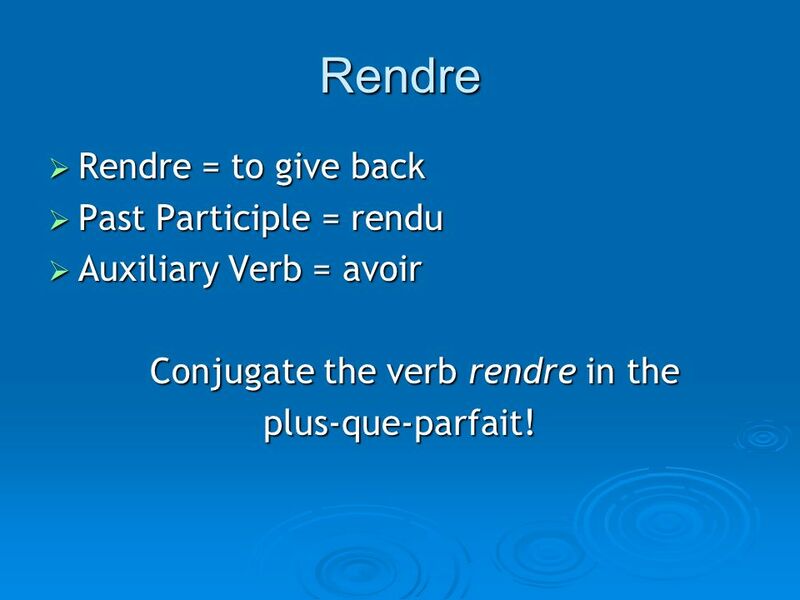 Use the same rules for agreement as passé composé. 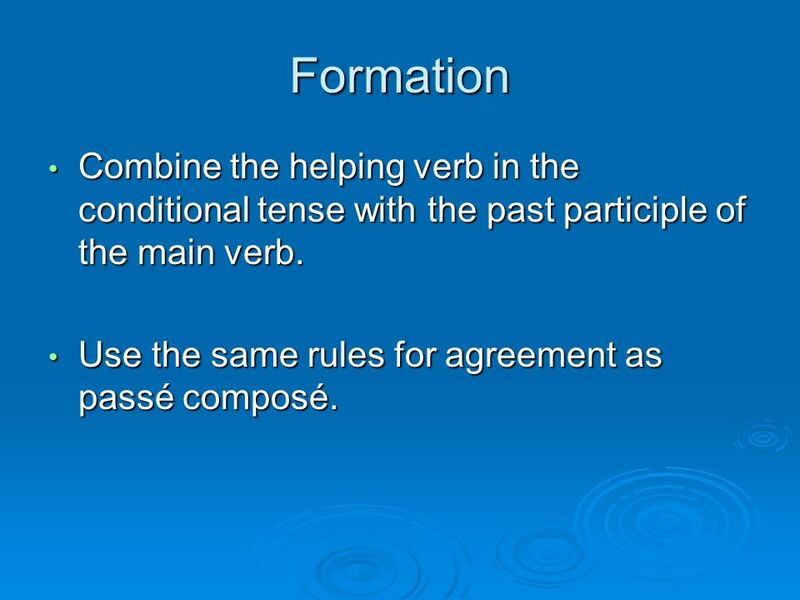 Use the same rules for agreement as passé composé. 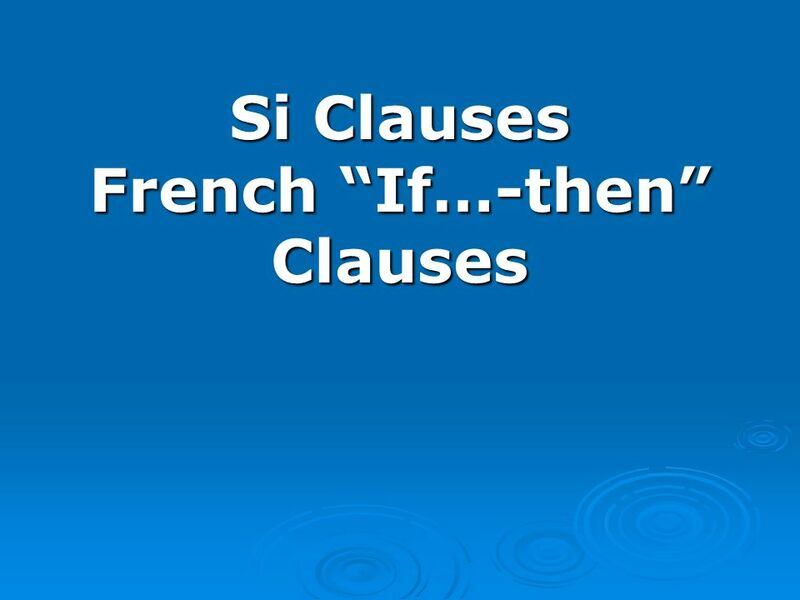 Télécharger ppt "Si Clauses French If…-then Clauses. 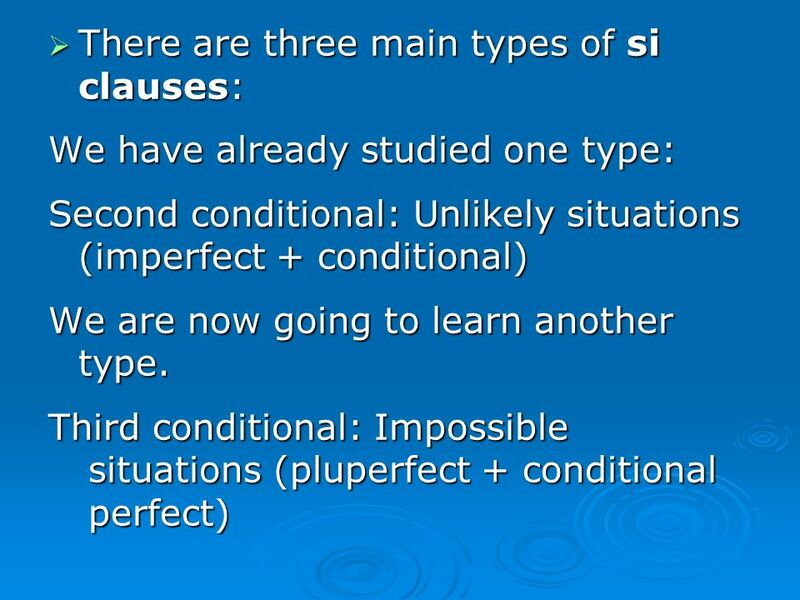 There are three main types of si clauses: There are three main types of si clauses: We have already studied one type:"
Les Phrases avec si Partie 2. Le Passé Composé avec Avoir Français 1441 Ch. 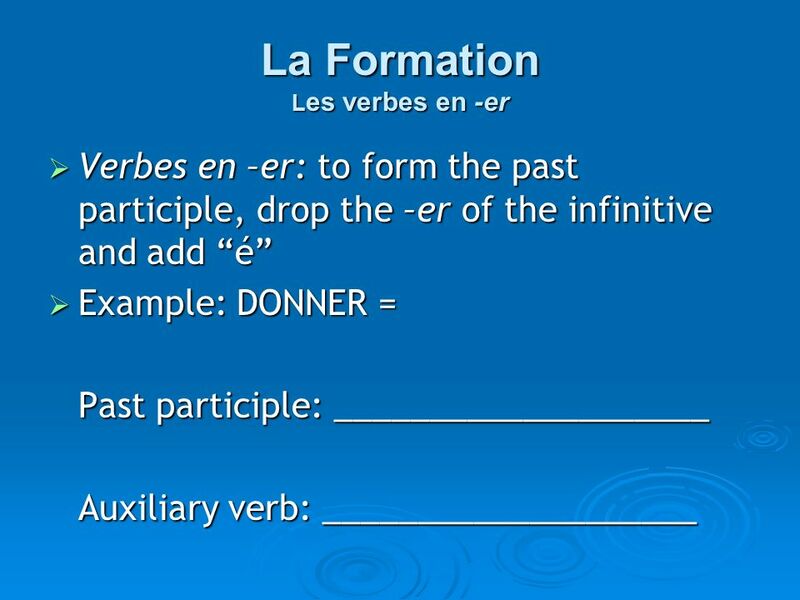 5 leçon 2.1. Le futur antérieur Future Perfect. Le Petit Prince Courtney Keeler et Christine Sowa.